Calamondin (Citrus microcarpa, × Citrofortunella microcarpa or × Citrofortunella mitis), also known as calamansi, is an economically-important citrus hybrid predominantly cultivated in the Philippines. It is native to the Philippines and surrounding areas in southern China, Taiwan, Borneo, and Sulawesi. Calamondin is ubiquitous in traditional Filipino cuisine. It is used in various condiments, beverages, dishes, marinades, and preserves. Calamondin is also used as ingredients in the cuisines of Malaysia and Indonesia. Calamondin is a citrofortunella, a hybrid between kumquat (formerly considered as belonging to a separate genus Fortunella) and another species of Citrus (in this case probably the mandarin orange). The name "calamondin" is the anglicized form of Tagalog kalamunding. Other common names of calamondin include: calamansi, calamonding, calamondin orange, calamandarin, golden lime, Philippine lime, Panama orange, Chinese orange, musk orange, bitter-sweets and acid orange. Calamondin was formerly identified as Citrus mitis Blanco, C. microcarpa Bunge or C. madurensis Lour., all those referred to it as a citrus. Swingle's system of citrus classification would put kumquats into a separate genus, Fortunella, making the calamondin an intergeneric hybrid, and in 1975 it was given the hybrid name × Citrofortunella mitis by John Ingram & Harold E. Moore based on Blanco's species name, but in 1984, D. Onno Wijnands pointed out that Bunge's species name, C. microcarpa (1832), predated Blanco's Citrus mitis (1837), making × Citrofortunella microcarpa the proper name. 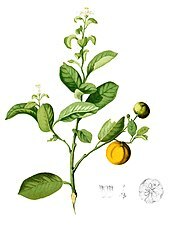 Phylogenetic analysis now places the kumquat within the same genus as other citrus, meaning that its hybrids, including those formerly named as × Citrofortunella, likewise belong in Citrus. Calamondin is widely cultivated in the Philippines, where it is called kalamansî ([kɐlɐmɐnˈsɪʔ], also spelled calamansi) or kalamunding by the Tagalog, Kapampangan and Pangasinan people; and limonsito or simuyaw [sɪˈmujɐw] by the Visayans. In Malaysia it is known as limau kasturi; and in Sri Lanka as hinnāraṁ (හින්නාරං). Calamondin also grows in the northern parts of Indonesia and southern China. It is available year-round in the Philippines and is usually seen in its unripened green state. When left to ripen it turns a tangerine orange. Calamondin, ×Citrofortunella microcarpa, is a shrub or small tree growing to 3–6 m (9.8–19.7 ft). The plant is characterized by wing-like appendages on the leaf petioles and white or purplish flowers. The fruit of the calamondin resembles a small, round lime, usually 25–35 mm (0.98–1.38 in) in diameter, but sometimes up to 45 mm (1.8 in). The center pulp and juice is the orange color of a tangerine with a very thin orange peel when ripe. Each fruit contains 8 to 12 seeds. There is also a variegated mutation of the regular calamondin, showing green stripes on yellow fruit. Calamondin is usually used in its not-so-ripe stage as sour seasoning for many Southeast Asian food such as the Philippine siomai pictured above. The fruits are sour and are often used for preserves or cooking. The calamondin bears a small citrus fruit that is used to flavor foods and drinks. Despite its outer appearance and its aroma, the taste of the fruit itself is quite sour, although the peel is sweet. Calamondin marmalade can be made in the same way as orange marmalade. Like other citrus fruits, the calamondin is high in vitamin C.
The fruit can be frozen whole and used as ice cubes in beverages such as tea, soft drinks, water, and cocktails. The juice can be used in place of that of the common Persian lime (also called Bearss lime). The juice is extracted by crushing the whole fruit, and makes a flavorful drink similar to lemonade. A liqueur can be made from the whole fruits, in combination with vodka and sugar. In Asian cuisines, the juice is used to marinade and season fish, fowl and pork. It is very commonly used as a condiment in Filipino cuisine dishes like pancit or lugaw, or in the basic sawsawan (dip) of calamansi juice and soy sauce/fish sauce used for fish, spring rolls, dumplings and various savoury dishes. The fruit is used in local recipes in northern Indonesia, especially around the North Sulawesi region. Fish are spritzed and marinated with the juice prior to cooking to eliminate the "fishy" smell. Kuah asam ("sour soup") is a regional clear fish broth made with calamondin juice. In Florida, the fruit is used in its fully ripe form with a more mature flavor profile than the unripe version. Tasters note elements of apricot, tangerine, lemon, pineapple and guava. The peel is so thin that each fruit must be hand snipped from the tree to avoid tearing. The entire fruit minus the stems and seeds can be used. It is hand processed and pureed or juiced and used in various products such as calamondin cake, coulis, marmalade, and jam. The peels can be dehydrated and used as gourmet flavoring with salt and sugar. The fruit was popular with Florida cooks in cake form from the 1920s to 1950s. 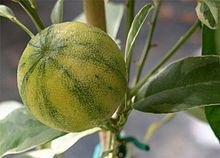 Floridians who have a calamondin in the yard often use the juice in a summer variation of lemonade or limeade, as mentioned above, and, left a bit sour, it cuts thirst with the distinctive flavor; also it can be used on fish and seafood, or wherever any other sour citrus would be used. Its cultivation has spread from the Philippines throughout Southeast Asia, India, Hawaii, the West Indies, and Central and North America. In sub-tropical and parts of warm temperate North America, ×Citrofortunella microcarpa is grown primarily as an ornamental plant in gardens, and in pots and container gardens on terraces and patios. The plant is especially attractive when the fruits are present. The plant is sensitive to prolonged and/or extreme cold and is therefore limited outdoors to tropical, sub-tropical and the warmer parts of warm temperate climates (such as the coastal plain of the southeastern United States (USDA zones 8b - 11), parts of California, southern Arizona, southern Texas, and Hawaii). Potted plants are brought into a greenhouse, conservatory, or indoors as a houseplant during the winter periods in regions with cooler climates. In its native homeland in Southeast Asia the calamondin grows well in cool and elevated areas and in sandy soils rich in organic matter. Waterlogged areas are not suitable for cultivation because no citrus tolerates continuously water-soaked soils. Budded or grafted trees will start to bear fruit one or two years after planting. Trees may live for forty or more years. In cultivation within the United Kingdom, this plant has gained the Royal Horticultural Society’s Award of Garden Merit (confirmed 2017). ^ a b c (07-10-2008). "×Citrofortunella microcarpa (Bunge) Wijnands". U.S. National Plant Germplasm System. Accessed on 12-09-2017. ^ a b Mabberley, D. J. (2004). "Citrus (Rutaceae): A Review of Recent Advances in Etymology, Systematics and Medical Applications". Blumea. 49: 481–498. ^ "ITIS Standard Report Page: X Citrofortunella mitis". Retrieved 2012-02-22. ^ "Citrofortunella Mitis – (Plants): Definition". Retrieved 2009-02-22. ^ "Calamondin". Merriam-Webster. Retrieved 11 November 2018. ^ "Calamondin". Oxford Dictionaries. Oxford University Press. Retrieved 11 November 2018. ^ "Calamondin". Dictionary.com. Retrieved 11 November 2018. ^ Wijnands, D. Onno (1984). "Nomenclatural Note on the Calamondin [Rutaceae]". Baileya. 2: 134–136. ^ Susanna Lyle (20 March 2006). Fruit & nuts: a comprehensive guide to the cultivation, uses and health benefits of over 300 food-producing plants. Timber Press. Retrieved 11 June 2012. ^ Morton, J. 1987. Calamondin. p. 176–78. In: Morton, J. Fruits of Warm Climates. Miami, Florida. ^ Mabberley, D.J. (1987). The Plant Book. A Portable Dictionary of the Higher Plants. Cambridge: Cambridge University Press. ISBN 0-521-34060-8. ^ "RHS Plantfinder - Citrus × microcarpa". Retrieved 12 January 2018. Wikimedia Commons has media related to Citrus × microcarpa. Calamondin – The Most Versatile Fruit at Aggie Horticulture.